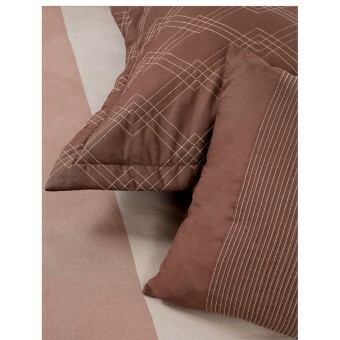 Liven up your bedroom with this contemporary bedding ensemble. 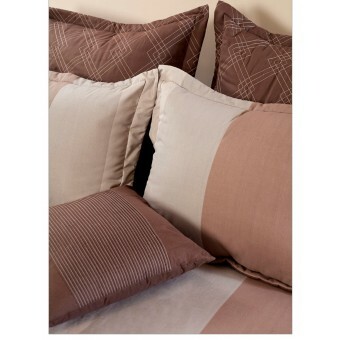 This bedding set boasts striped channels of tonal multi-color with matching geometric pattern embroidery. Made of poly/cotton w/polyester fill for comforter and sham. Dry clean only. Imported. Set Includes: Pieced comforter (Queen = 88 x 94, King = 106 x 94) w/matching solid back, pieced flanged sham (standard sham for queen set, king sham for king set), solid tailored bedskirt, 1 decorative pillow & 2 euro shams.